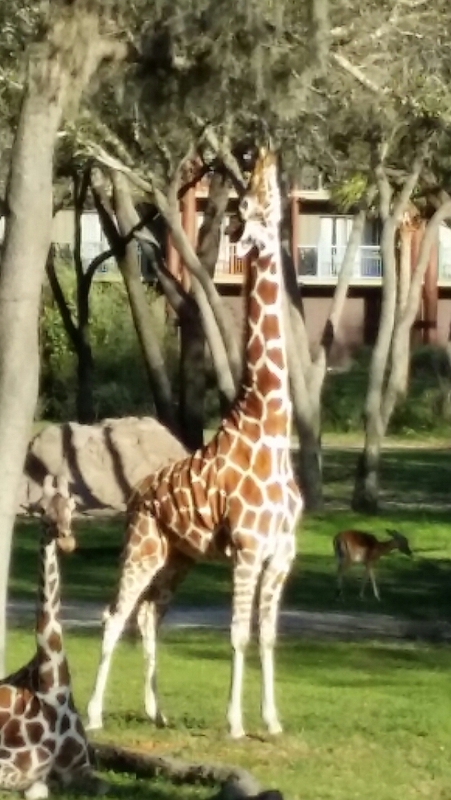 I saw this giraffe at Disney’s Animal Kingdom last weekend. He was reaching so high his neck muscles were strained. When he couldn’t get what he wanted he took the longest black tongue I have ever seen in my life, and stretched it as far as it would go. I am vertically challenged so I have spent a lifetime jumping on counters to reach in cabinets, straining my neck to see over a crowd, learning a super overhead in tennis because most people want to lob over me. I commented that the poor giraffe, nature’s tallest land animal, must be so disappointed to be so tall and still not be able to reach what he wants. But he NEVER gave up. He reached that neck and extended that black tongue, and he held that pose forever. He was not discouraged and it appeared that he BELIEVED he would REACH his destination. But that giraffe didn’t think he “should” be able to reach whatever he wanted because of his height, he just DID IT! He wanted something so he went after it. He had no preconceived notion of what he should or shouldn’t be able to do. And things looked bleak for him. From my point of view he would not reach those leaves anytime soon. And I would venture to guess that Mr. Giraffe had tried the day before with the same gusto. And probably the day before that. And he would try again tomorrow. And guess what? Eventually the leaves on the tree were going to grow enough to actually be within his reach. And on that day he would stretch his neck, extend that huge black tongue and BINGO! One sweet tasty morsel will have been tasted by that giraffe, and that would be enough for him to try again tomorrow. And the day after that. I challenge you to be steadfast like that giraffe. Don’t make distinctions, or excuses, about why you can’t reach a goal. Just because you can’t reach the leaves today doesn’t mean you should stop trying. Because they may just grow enough overnight for you to reach them tomorrow. Reach, reach higher! 🙂 So happy it spoke to you! I didn’t even want to say “vertically challenged” but…it is what it is! Have a super weekend!